We're "over the moon" here in San Francisco! 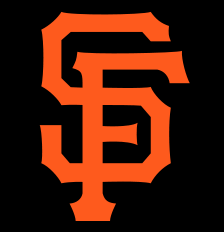 Our beloved Giants won the World Series last night! And did the City ever go crazy! There will be a parade tomorrow and I'm sure all kinds of celebrations. But no one is celebrating more than this man. He has been a Giants fan ever since his father took him to see a game in the late 50's, after the team first came to San Francisco. The Giants have been breaking his heart ever since! They call it "torture" here. Well my friend Lou, they finally did it! It only took 56 years! Who knew at the beginning of the season that a bunch of "cast-offs," and rookies, along with incredible talented pitchers would form a team with so much heart that they would go on to win the World Series! They call it Destiny! We too are deliriously happy! It was a long time coming but this team made it oh so sweet!!!! Lou is our son Alex's Godfather. Alex is the second biggest Giants fan! And yes, I'll be looking for you too at the parade! Congratulations to the Giants. Here in N FL we were rooting for the Giants as well since Buster Posey is a graduate of FSU in Tallahassee. I expect he will get Rookie of the Year. He had an awesome World Series. A rookie has not been a starter in a World Series since Yogi Bearer. I hope I spelled his name right??? Good for you, wish we Mariners knew that feeling! 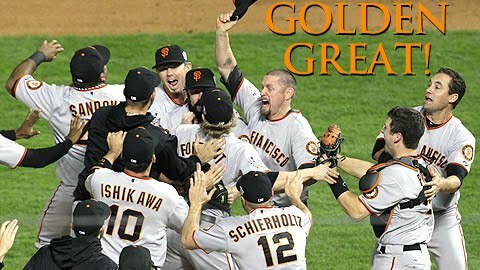 It certainly was exciting to see our Giants win the World Series! Here in the Big Valley we are baseball crazy and watched every minute. Thank you boys of summer for so much happy entertainment. We were sad because we so wanted our TEXAS RANGERS to win....but we were proud they were good enuf to make it to the World Series. from a baseball fan in Ohio ... Congratulations!!! How sweet it is! Your photos are great. I especially like the team celebrating.